Fresh Basil, Mozzarella and Roasted Tomato "Pizza"
I love having pizza almost every week, usually a Friday night when everyone is home and excited that the weekend is finally here! There is just something about that yummy, cheesy dish that makes me sooo VERY happy and I love that my entire family enjoys it! Because I have been eating healthier and focusing on my health these days, I don't eat the unhealthy, carby delivery pizza anymore. 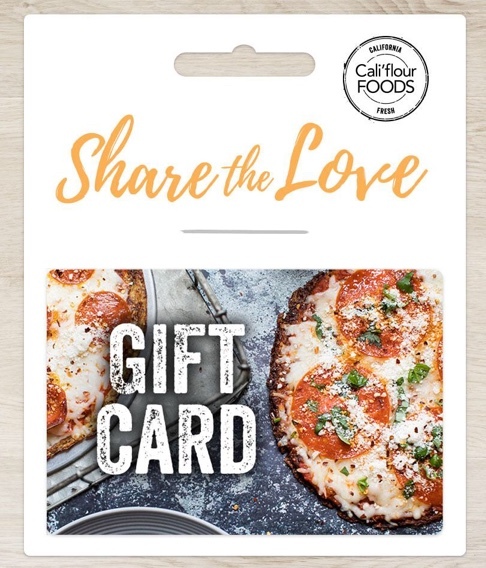 Instead, I have been getting cauliflower crusts online at Cali'flour Foods. 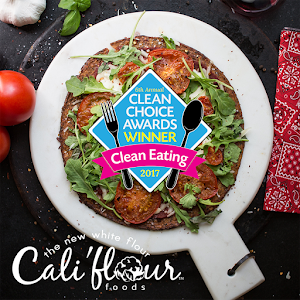 I can not say enough great things about Cali'flour Foods! I love their crusts because they taste great and they are so convenient to have in the freezer! They last up to 9 months in the freezer and up to 7 days in the fridge so they last a long time! Sure, I can make my own crusts, but it is so much easier to have it already made for you! Check them out and give them a try! 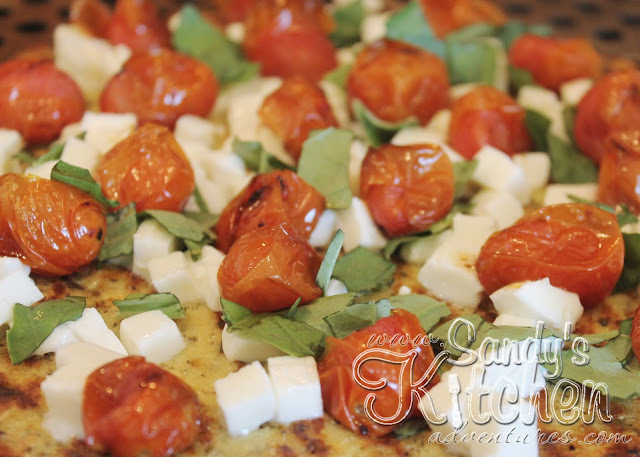 One of my favorite pizzas to make is a fresh basil, mozzarella and roasted grape tomato pizza. Simple fresh ingredients that adds lots of flavor! I have a perforated pizza pan which is a pan with holes on the bottom. These holes allow the heat to heat the pizza crust directly while baking, resulting in a crispier crust. Plus it speeds up baking time! I lightly sprayed the crust with olive oil cooking spray and then added fresh minced garlic. Then I baked the crust for about 8 to 10 minutes at 400 degrees. Let it cool at least 10 minutes to get a firmer crust. 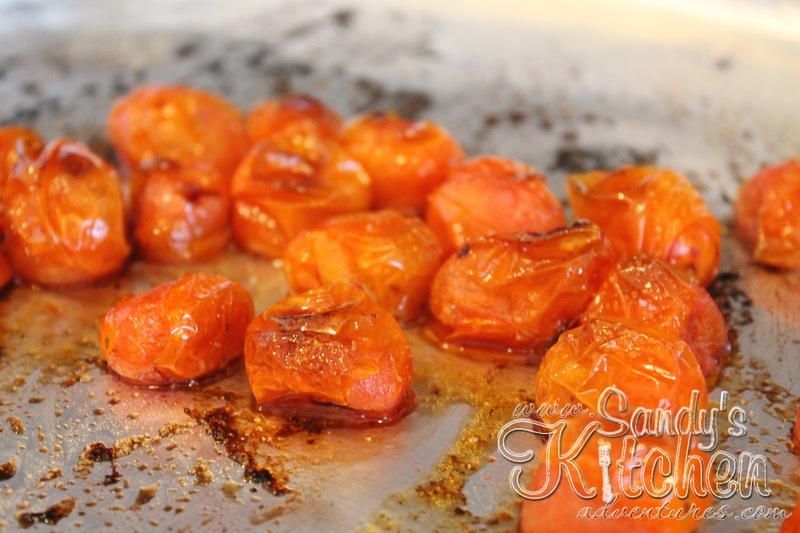 Next, I roasted grape tomatoes on a non-stick foil lined baking sheet. I sprayed them lightly with olive oil cooking spray and roasted them for about 15 to 20 minutes at 400 degrees. 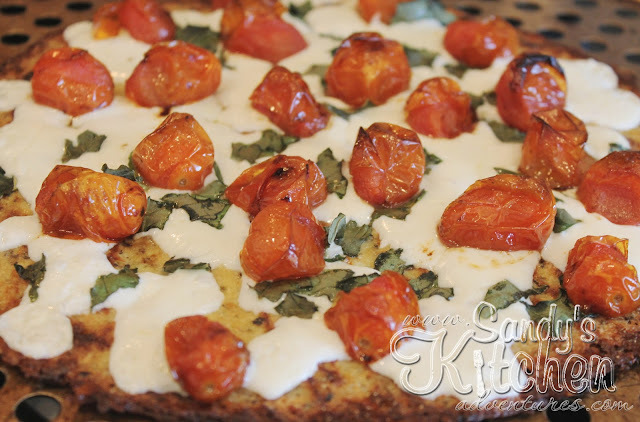 Roasted tomatoes make sweet and tangy bursts of flavor in your mouth so don't skip this step! The recipe would not be the same without them! Add mozzarella, chopped basil and the roasted tomatoes to the pizza crust. Bake for an additional 5 minutes at 400 degrees or until cheese has melted. 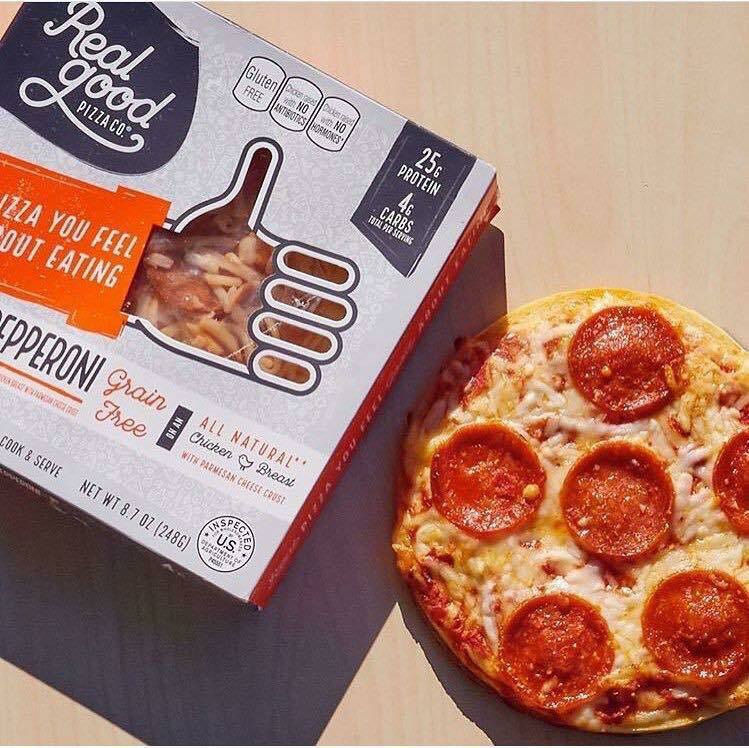 Look at that delicious pizza! Now what is it missing? 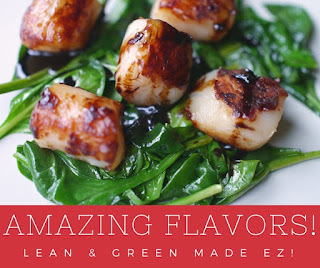 A delcious sweet and tangy balsamic vinegar reduction! 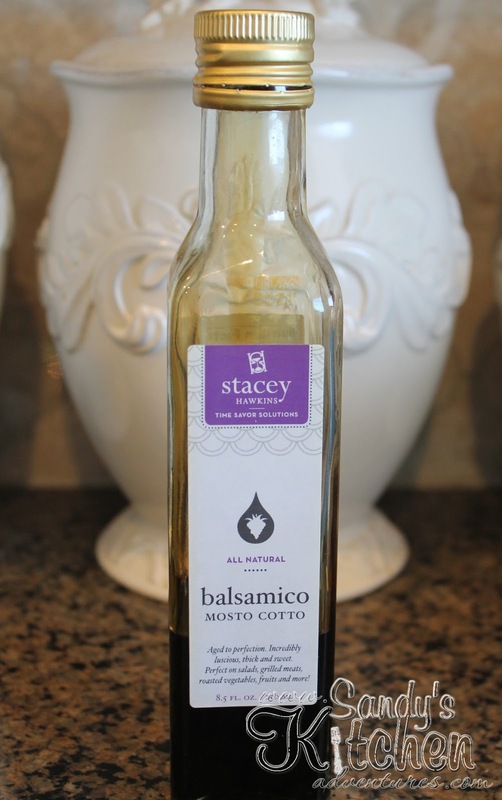 I love Stacey Hawkins Balsamico Mosto Cotto! Balsamic reduction is slightly thicker and more syrupy than regular acidic balsamic vinegar. If you don't have this, you can always drizzle a little balsamic vinegar on top, but know that it isn't quite the same as a balsamic reduction. This one is 3 grams of carbs and only 10 calories for 1 tablespoon! 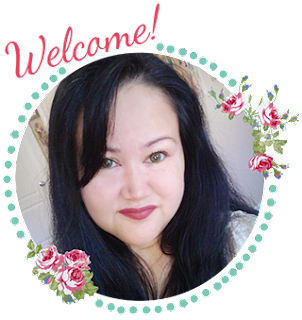 Click Here to check out her other products and sign up for her newsletter for recipes, tips and specials! Preheat oven to 400 degrees. Line a baking sheet with non-stick foil. Spread grape tomatoes on pan. Spray tomatoes lightly with olive oil cooking spray. Bake for about 15 to 20 minutes. Set aside. Preheat oven to 400 degrees. 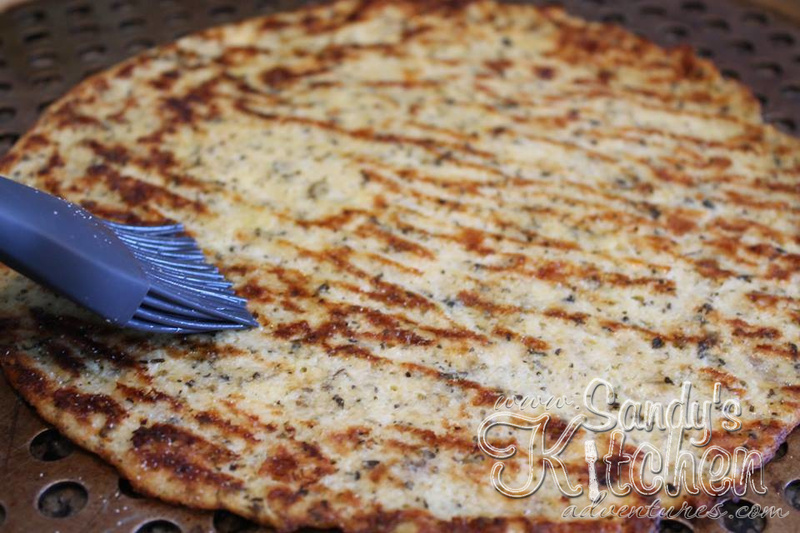 Place pizza crust on pan with parchment paper, pizza stone or pizza pan with holes. Spray the crust lightly with olive oil cooking spray. Spread minced garlic on top of crust and bake for about 10 minutes. Let cool for 10 minutes so crust can firm up. 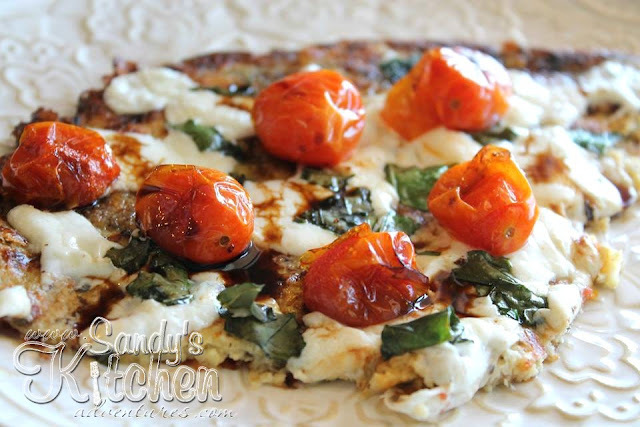 Add mozzarella cheese, fresh basil, and roasted grape tomatoes on top of the pizza crust. Bake 5 more minutes or until cheese has melted. Drizzle with Balsamic Mosto Cotto or balsamic vinegar.